In the 1960s and 1970s, when my four siblings and I were kids, we weren’t allowed to eat Oreo or Pepperidge Farm cookies. Tootsie Rolls were off limits, too. So were Bazooka bubble gum and Jelly Bellys. And though we often heard the commercial jingle proclaiming “Nobody doesn’t like Sara Lee,” that was a claim the Jacoby youngsters could never verify empirically. Our parents weren’t opposed to sweets. But we grew up in an Orthodox Jewish home where kashrut — the kosher dietary laws — were observed. And none of those yummy treats was kosher. Now, however, all of them are kosher, along with scores of thousands of other products available in American supermarkets — everything from salsa and spring rolls to salmon and scotch. And thereby hangs a tale: a tale of age-old religious commitment combining with capitalist innovation to transform a major US industry. America has undergone a kosher revolution. It wasn’t all that long ago that demand for kosher food was restricted to a tiny niche of the public — Jews amount to less than 2 percent of the US population, and only a minority of Jews keep kosher. When my mother, who was raised in a nonobservant Jewish home in Ohio, began keeping the dietary laws in the early 1950s, she at first had so much trouble finding kosher food that in three months she lost 20 pounds. Today, kosher is everywhere. More than 40 percent of packaged foods and beverages now sold in the United States are kosher, their labels bearing the logo of a trusted kashrut-certifying agency, such as the Orthodox Union or Star-K. Mainstream supermarkets routinely stock large kosher sections. Some grocery chains have become a kosher foodie paradise. American consumers spend an estimated $13 billion annually on kosher food, with sales growing by double digits each year. In her 2010 book “Kosher Nation,” a deep dive into kashrut in contemporary America, journalist Sue Fishkoff explained that the desire for food certified as kosher goes far beyond the relatively tiny demographic of observant Jews. “More than 11.2 million Americans regularly buy kosher food, 13 percent of the adult consumer population,” Fishkoff writes. “These are people who buy the products because they are kosher, not shoppers who pick up Heinz ketchup, Miller beer, or Cheerios because they like the taste or the price.” But only about 1.5 million of those customers are Jews committed to keeping kosher, she points out, which means that “at least 86 percent of the nation’s 11.2 million kosher consumers are not religious Jews.” Eighty-six percent! With the rise of 20th-century food technology, determining whether a product was kosher increasingly required expertise far beyond the ken of a typical Jewish homemaker. That led to the birth of professional, nonprofit kashrut agencies. “In the early 1920s, the [Orthodox Union] came up with a plan to offer food manufacturers a kosher supervision and certification process that would be recognized by Jewish consumers nationwide,” Fishkoff recounts. 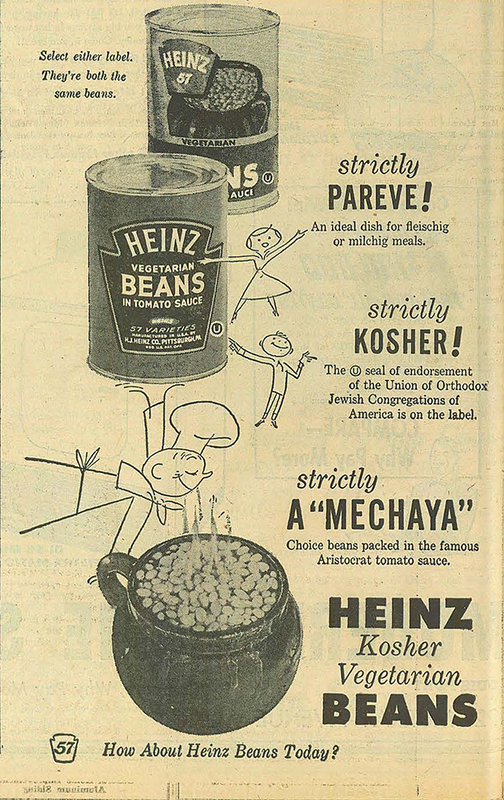 The first company to take up the offer was Heinz, whose canned vegetarian beans began carrying kosher certification in 1923 — a distinction the company played up in advertising targeted to Jews. But other companies were slow — very slow — to follow suit. In 1945, the Orthodox Union’s kosher symbol appeared on just 184 products made by 37 companies; by 1961, that had grown to 1,830 products from 359 companies — still a mere drop in the food-industry bucket. Big Food’s stampede to kashrut has turned kosher certification into a global operation. According to Orthodox Union officials, the agency now certifies 800,000 products produced in more than 8,500 plants in nearly half the world’s countries. And it is only one (albeit the largest) of the kashrut agencies. Some foods, of course, can never be kosher. Unlike the forbidden Oreos of my youth, McDonald’s double cheeseburgers and New England clam chowder will never be brought under the tent. But kosher has undeniably gone mainstream. In the rise of the kosher-industrial complex, all parties have come out ahead. It has generated a vast array of formerly inaccessible options for a small religious minority. It has enabled a key industry to meet a growing market demand and reap billions of dollars in revenue. It has enriched contemporary American culture with one of the most ancient food traditions of all. And it has done it all not through top-down coercion, but through voluntary private cooperation.